Before there was #vanlife, there was trailer life. In the 1950s and ‘60s, hitting the great highways and meandering backroads of the US with the family and a nicely outfitted trailer was the best way to see the country, and tons of great models emerged from that time period, including the now-iconic and coveted silver Airstreams. Nowadays, you’re more likely to see sleek modern RVs and boxy fold-out campers at campsites, but these charming relics of the USA’s great road-trip era are still floating around and finding new life as short-term rentals all over the country. 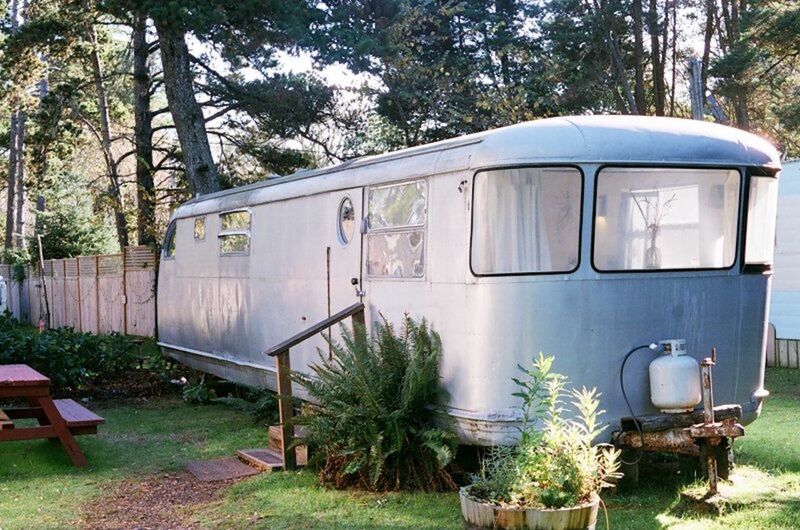 So crank the jukebox and crack open a soda pop: These are the 10 most adorable vintage trailers that you can rent around the US. 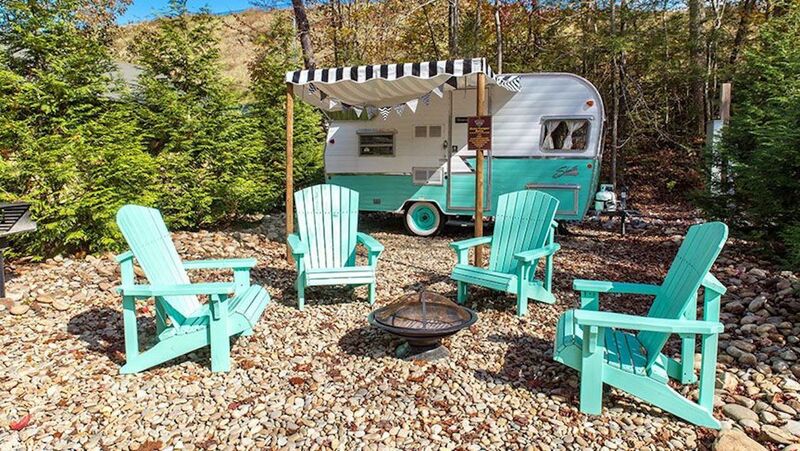 The ambiance of this vintage trailer resort in the heart of Oregon wine country is so spot on that you’ll feel like you’ve gone back to the 1950s. 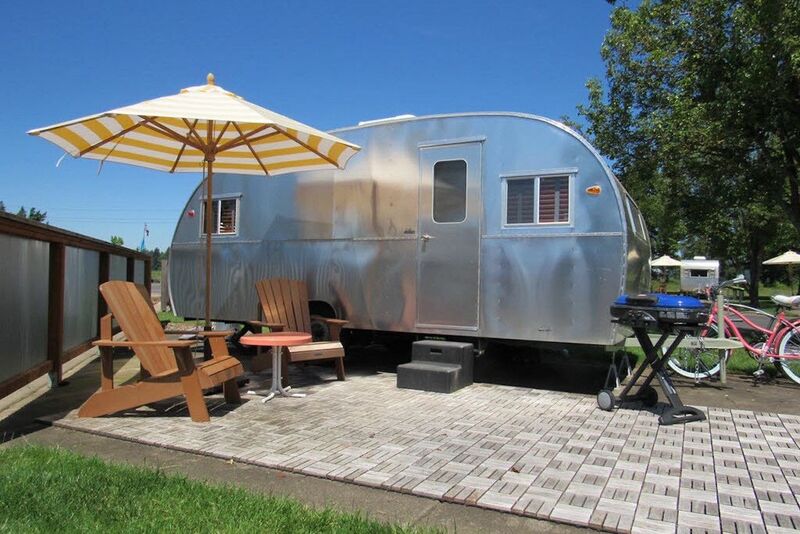 Thirty-three vintage trailers of different makes and models — all immaculately restored and upgraded with modern amenities like hotel-quality linens, cozy beds, robes, and pour-over coffee — each have their own lot on the 14-acre Willamette Wine Country RV Park. Models range from sleek and shiny Airstreams to classic two-toned Shasta Airflytes, famous for their blaze of pastel (like red or turquoise) along the bottom of the trailer and “canned ham” design. Different trailers can accommodate between two and four people, and each comes with a private bathroom and outdoor area. Guests can use propane grills to make a barbecue, sit outside and enjoy the sunshine while sipping wine from the nearby vineyards, or go for a splash in the pool. Visit the website for rates. 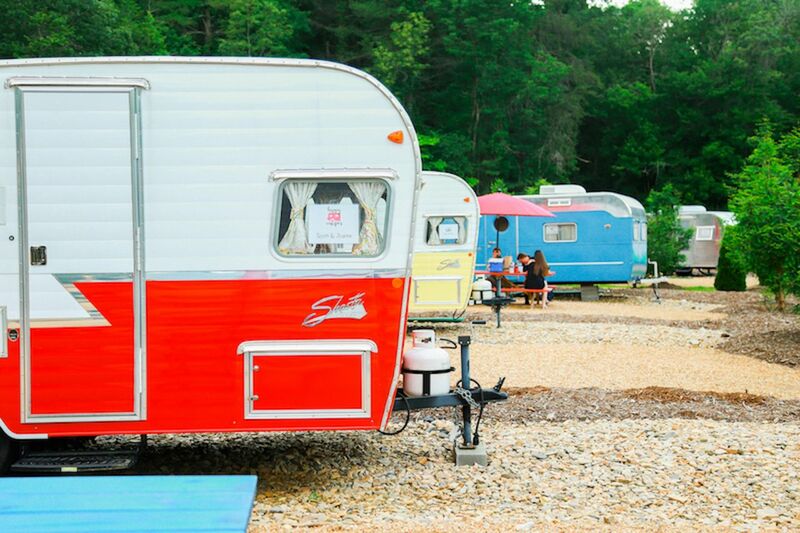 While these two 1961 Shasta Airflyte trailers at the luxury outdoor resort Camp Leconte in Gatlinburg, Tennessee, are technically described as replicas of the original, they’re just too cute not to want to stay in. The two models — named Glamping at Tiffany’s and The Ruby Slippers — have either red or turquoise color schemes, with cozy wood interiors and checkerboard floor. Each comes with a dinette that converts into a bed, a fridge, AC, a fire pit and charcoal grill, and are located close to the bathhouse. 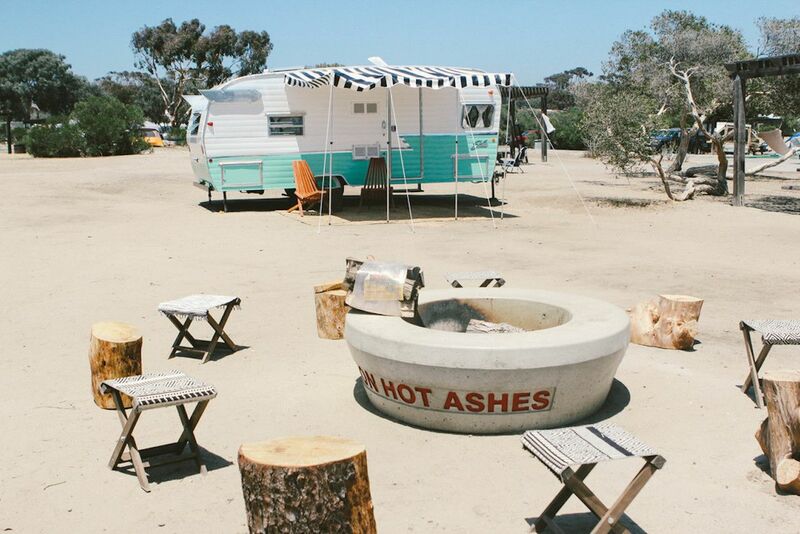 Perfect for glamping lovers or fans of the Breakfast at Tiffany’s and Wizard of Oz films. Visit the website for rates. With its clear night skies, wide open spaces, and seclusion, the high plains of New Mexico have long been a popular spot for those wanting to commune with nature and live outside the status quo. In the small town of Taos, where living in alternative dwellings like Earthships is just par for the course, the Hotel Luna Mystica fits right in. Located out in the middle of the Taos Mesa — but just a short walk from a local craft brewery — the hotel’s 10 vintage trailers from the ‘50s and ‘60s have each been outfitted with features like outdoor decks, hammocks, and fire pits. Each has been restored to its original splendor, with hip interior decor and names that match their individual vibes. Each trailer is unique in its own way, but they all make you feel like packing up your whole life and moving to New Mexico to live under endless skies with no troubles. Depending on the trailer, prices start around $55 and up a night. Have you ever wondered what the stars of those classic ‘60s and ‘70s bands do when not touring or writing music? Well, in the case of Kate Pierson of the B-52s, she opened an award-winning vintage trailer park. For lovers of that chill California vibe, Kate’s Lazy Desert resort is just the ticket. A short drive from Joshua Tree and Palm Springs, Lazy Desert has six different themed vintage airstreams, like the splashy and colorful hippie “Hairstream,” the fantastically kitschy “Tiki” Tiki bar-themed trailer, or “Lava,” colored on the insides with bright orange blobs of paint to give the impression of being inside a lava lamp! 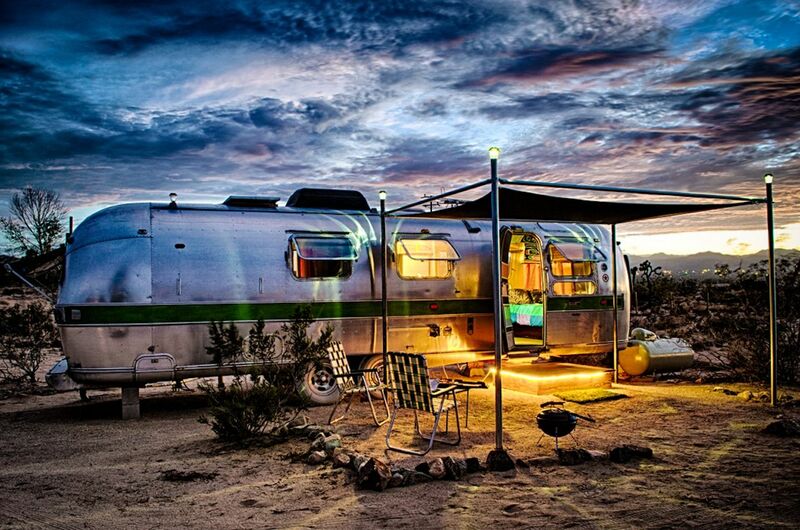 The concept for each Airstream comes from different artists, and in addition to their whimsical designs and decor, each one has a full bed, a bathroom, a small kitchenette, and endless desert and night sky views. Prices start at $175 a night. Does it get cuter than a vintage trailer on an actual peach farm? At Schnepf Farms in Queen Creek, Arizona, a short drive from Phoenix, you can go glamping at The Cozy Peach — a small collection of renovated Airstream trailers brought to life by husband and wife duo Mark and Carrie Schnepf. The nine trailers — with one more on the way — each have their own aesthetic and include both sleeping and living spaces, a bathroom, modern amenities like WiFi and Netflix, and outdoor lawn space. For breakfast, you can choose between foraging for fresh fruit and veggies in their U-Pick garden; grabbing a slice of the butteriest, juiciest peach pie you’ve ever had at their bakery and country store; or simply order a home-cooked meal delivered directly to your trailer to enjoy in bed. Time your stay with early spring, and you’ll be able to enjoy stunning peach blossoms while you bike around the farm. Prices start at $145 a night. Escape into the wilderness of North Carolina in vintage style at this charming retro resort near Asheville. Secluded in a quiet river valley, the 50-acre Junebug Retro Resort is a popular wedding and outdoor events venue, thanks in big part to its meticulous attention to detail in creating the illusion of 1950s paradise. 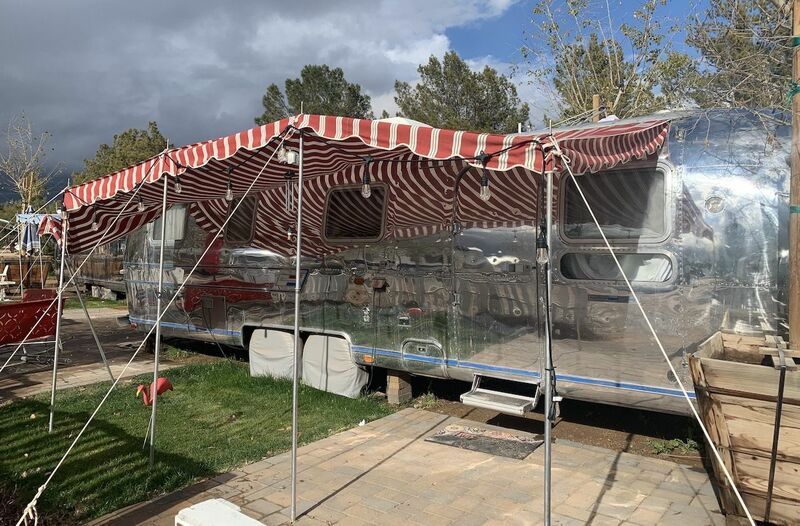 The property is home to 10 different vintage trailers, including Spartanette Imperials and Royals, a Yellowstone 16’, a Trotwood, and an Anderson. But it’s the collection of Shasta Airflyte trailers that are the true gems: five cute-as-can-be Shastas in Butternut Yellow, Matador Red, or Seafoam Green, with checkerboard flooring and wood paneling on the inside. 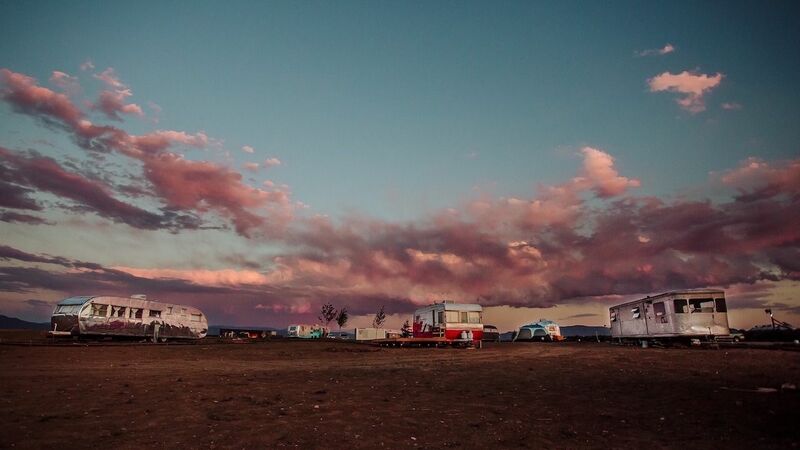 The different trailers sleep between two to five people and have amenities like a kitchen with fridge and gas stove, AC, linens, and access to fully equipped bathrooms. Pricing varies depends on event and season. Located on scenic Long Beach Bay in Seaview, Washington, the historic lodgings at Sou’wester have long been a popular Pacific Northwest wilderness retreat. While visitors can stay in a variety of accommodations from suites to cabins, their selection of restored vintage trailers is the main attraction. There are over 22 trailers to choose from, and they range in size from Rustic 16’ to spacious 40’ Deluxe; amenities vary depending on size, but all come with a kitchen or kitchenette, water, electricity, and heat (as well as access to a bathroom if one isn’t part of the trailer). Some of the most popular models include the Buena Vista, a 1947 Spartan outfitted in warm wood with red upholstery; the Old Spartan Park Model with its minimalist white interior; and the quaint and pastel-hued Estrellita. Visit the website for rates. The Holidays is a camp community poised on a bluff over the ocean in beautiful San Clemente Beach, California. Three of the four vintage trailers — the Muir, the Drifter, and the Roadrunner — are classic Shastas, with that iconic colorful zig on the bottom of the body of the caravan, wood interiors, and checkerboard flooring. The trailers are ringed around an outdoor communal space, with a fire pit and picnic area. Each trailer can accommodate four people and comes with amenities like a kitchenette and AC. Prices start at $189 a night in the low season (November through March). 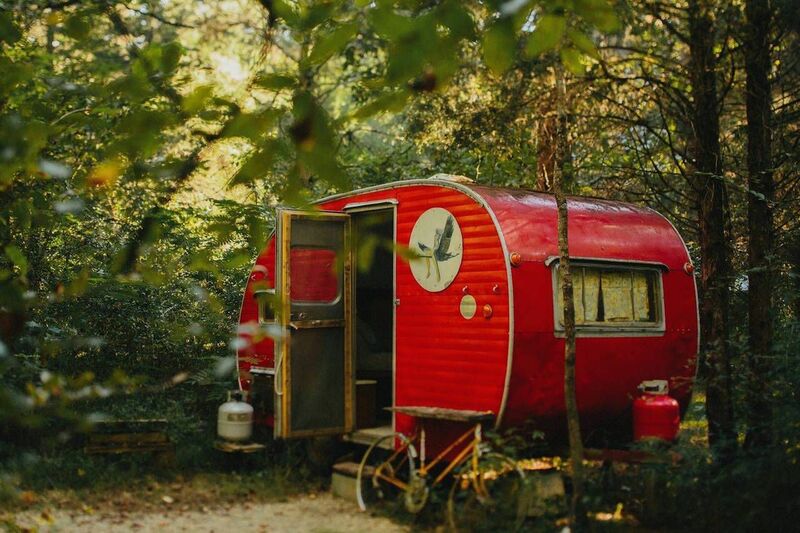 This tiny Shasta, nestled in the woods of Cosby, Tennessee, is about as adorable as it gets when it comes to vintage trailers. The shiny red exterior is a dreamy contrast to the dark green and brown of the surrounding woods, making for a perfect Instagram pic. The interior is small but cozy, including a bed, dining area, and kitchenette. The stand-apart bathroom is another part of the charm, with the outhouse built of reclaimed popular and an outdoors claw-foot tub that can either provide a cool respite from the humid Smoky Mountains or heated with fire for a “hillbilly hot tub” during cool weather. Guests can also make campfires, and breakfast is provided every morning. Prices start at $70 a night on Airbnb. 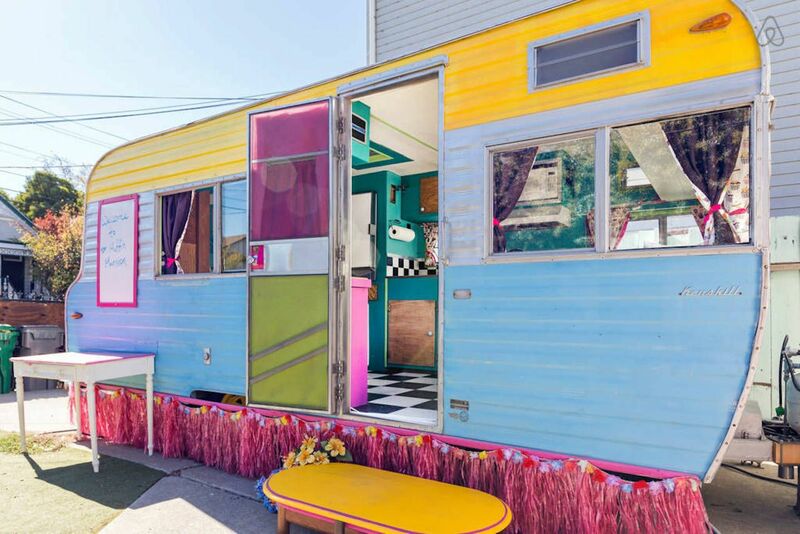 The pleasures of glamping in vintage trailers don’t exclusively have to be enjoyed out in the wilderness; you can find plenty of urban camping experiences in the some of the biggest cities in the US, like at this fabulously flashy trailer Airbnb in Oakland. The exterior of this vintage Kenskill is truly a glorious sight: painted in vibrant shades of baby blue, yellow, and its chrome has been polished to an absolute shine. On the inside, it only gets better: turquoise walls offset by wood cabinets, colorful bedding and decorations, and that classic black-and-white checkerboard floor. Housed in a green backyard with chickens, it can accommodate two guests and comes with a bathroom with shower, kitchenette, dining area, WiFi, and linens. Prices start at $75 a night.